There are currently 29,485 users on this website. I originally mentioned this in a different post but thought it might be good to make a separate topic to be easily updated when more information is added. Another program has not been announced and will be in a similar product, but I can't yet go into details on that. he has something else in store. So we know they are planning an unannounced coin and it will be in a product 'similar' to the proof set. The Proof set has the proof W cent, the Silver Proof will have the reverse proof w cent, and the uncirculated set will have the uncirculated w cent. Unless I am reading the word "similar" too narrowly, there aren't too many more options are there? Maybe the Limited Edition Silver Proof Set will have a silver cent. Maybe the Innovation Proof Set will have something special. Or, maybe something in one of the sets for children, like the youth coin and currency set. This is obviously all speculation but now I know to pay close attention for the next few months. I agree with Director Ryder that there is an INITIAL increase in proof set sales, most likely due to the proof W cent. So far, we only have the first 3 weeks of sales data. At around 250K sold, it is more than a 17% increase compared to the average sales for the first 3 weeks over the past 3 years (2016-220K, 2017-217K, 2018-202K) and it reverses a declining trend of initial sales. It's yet to be determined whether or not the increase lasts and ultimately results in higher sales for the entire current year and higher sales in future years. You're right. I meant to put unannounced but had a brain fart. Sorry. Cool data. Thanks for sharing, BadDog. 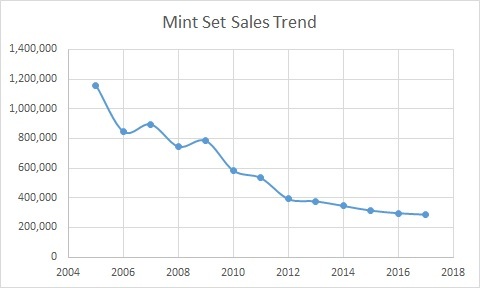 It makes you wonder why the 2012 mint set is so much more expensive than the others.